The 30 Years War was a major turning pointing in the relation of civil populations and conflict. It was a war over the role of religion in society. The Protestant threat was not as a rival Christian organization, but in the belief in state supremacy over theological power sharing. It was a loss of power for the papacy. As a result, war was inflicted on armies and civilians alike. The conflcit was originally a religious conflcit between Catholics and Protestants but eventually turned into a great power conflict fought out between the France and Germany (via the Holy Roman Empire). The Reformation has shifted religious dogma along with political boundaries. In this period, the Catholic Church held enormous sway over national government and the kings and queens of them. The growing Protestant influence was a direct threat to the power of the church in national politics. This shifting of politcal fortunes was most felt in Germany and throughout the Holy Roman Empire. The conflict began with a struggle over succession to the crown in the Holy Roman Empire with the death of Emperor Matthias and the ascension of a designated heir (he had no children), who was Catholic (later called Ferdinand II, who was Crown Prince of Bohemia). This led to an uprising by Bohemian Protestants. The new king called upon Catholic Spain who intervened on his behalf. The Dutch, then under Spanish rule, then revolted and joined the Protestant cause, as did Denmark-Norway and Sweden. Since the Reformation began, large parts of the HRE had become Protestant. The war fought in the Holy Roman Empire (HRE) but the participants were from all over Europe, both in a formal and an informal capacity. The HRE was an odd collection of states that stretched from the Netherlands, to Austrian and Hungary, and all of the Germanic states. To the north the English and the Scandanavians had become Protestant. 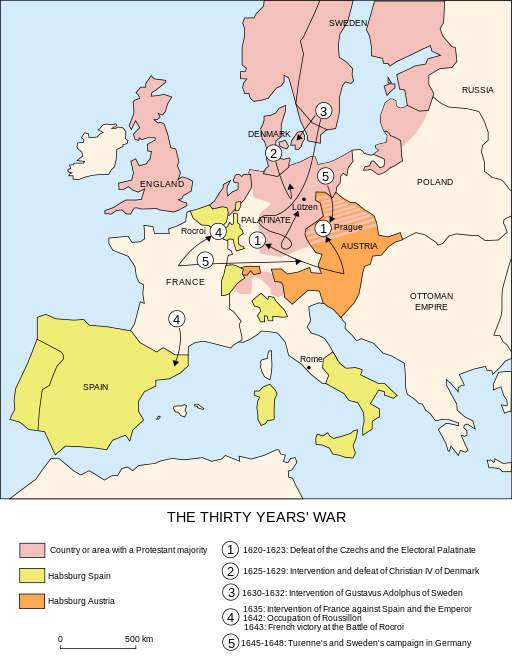 The southern states of France, Spain and Italian papal states remained in the Catholic camp. Over the 30 years, some combatants entered and left, England, Scotland, and Russia were involved at various times. The King of Transylvania (a Protestant) sought and received aid from the Ottoman Empire, who fought a war against Catholic Poland. The war was fought over the same ground again and again for 30 years. It resulted in one of the greatest famines in Europe in after the Dark Ages. Most of the fighting took place in modern day Germany. Most of the HRE were small principalities and mini-states. They faced off against large-scale battlefield armies from one of the major powers of the time in Spain. Spain wanted to retain control of the Netherlands, that was part of the HRE. 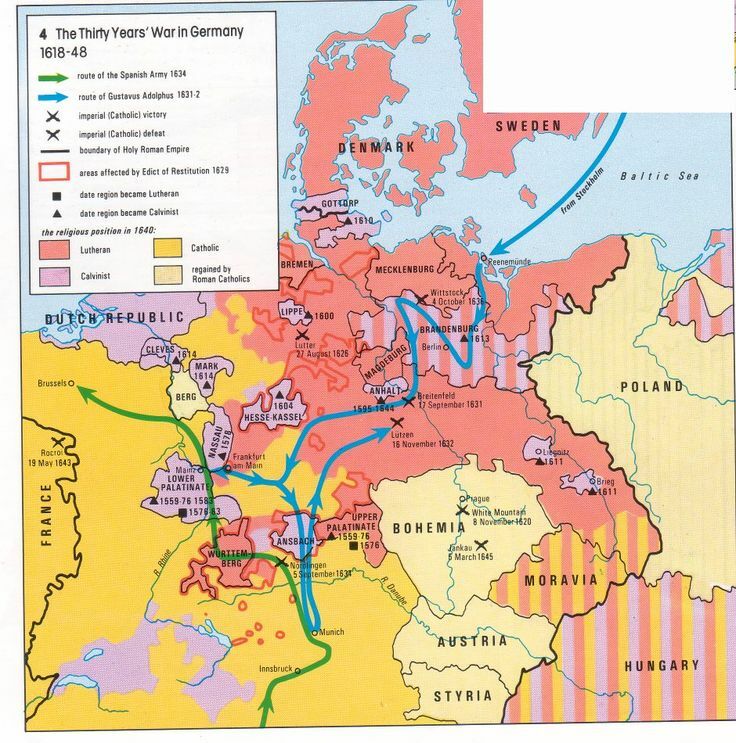 The Treaty of Westphalia, which ended the war, laid the framework for conceptualization of the modern nation-state. The treaty also recognized the political state as superior to the religious state. Up to this time, the pope was influential in the politics of most European countries. After the war, it's hold on power was dramatically weakened. 5. Actors: Holy Roman Empire, the Papacy, Spain, the Netherlands, Austria-Hungary, Sweden, Denmark, Poland, Ottoamn Empire, Russia, and others. David Zhang of Hong Kong University noted a rise on conflict in the 17th century in Europe and China. He speculated that the conflict were in part the result of extremely cold temperatures, accompanied by crop failures. This period was the high point of the "Little Ice Age" (Reardon). However, it is not clear as to the mechanism that engendered the role of climate. It may have been a contributing factor. Marauding armies killed civilians, burned or stole their crops, and directly caused many deaths notwithstanding the famine. Since many troops in the war were in fact mercenaries, looting and stealing was considered part of their salary. Besides famines and murder, pestilence and diease also followed. With the movements of so many people from so many lands, diseases from differing parts of the continent were mixed into the cauldron. Bubonic plagues and typhus broke, often as a result of the siege of walled cities and castles where inhabitants were surrounded in a virtual prison for years as they gradually ran out of food. Citizens with little medical knowledge assumed that evil forces were responsible for all the dying. As a result, witch hunting rose to a level that has not been since since. Destruction of agriculture was a policy in the war and contributed greatly to the famines. After defeating a village, the crops and fields would be bruned and the animals stolen, eaten, or slaughtered. This was a Pan-European conflict. The Ottomans were drawn in to support Transylvania, which had in turn supported the Hapsburgs. 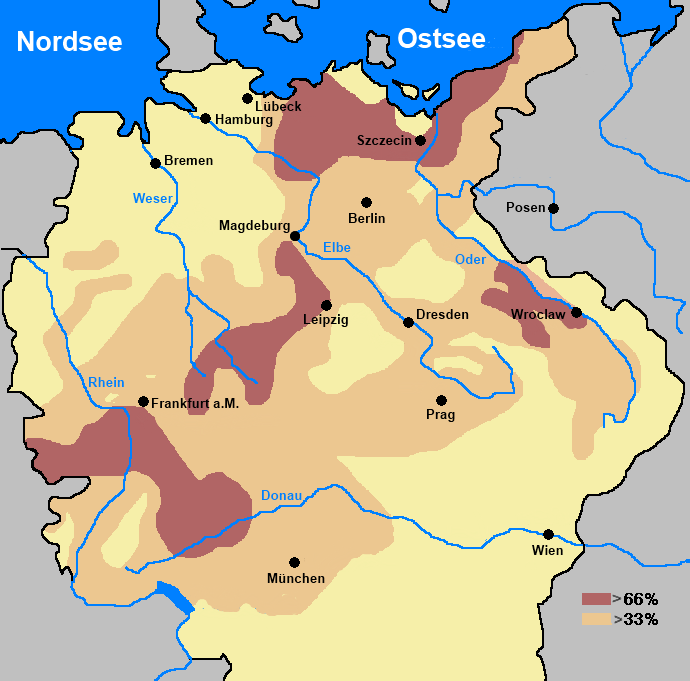 Germany to this day remains more Catholic in the south and more Protestant in the north. On that count, the war chnaged very little in terms of the map of Europe. Peter H. Wilson, Europe's Tragedy: A New History of the Thirty Years War (London: Penguin, 2010).